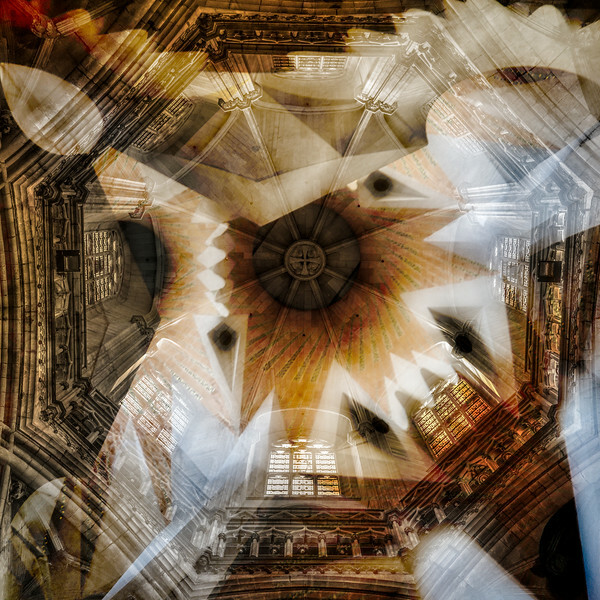 This is a composite of the inside of two cathedrals in Barcelona. One is the gothic Cathedral of Barcelona and the other is the post gothic Sagrada Família which was designed by Antoni Gaudi. The two edifices could not be more different. The only thing they have in common is they are Roman Catholic. The architecture of the gothic is filled with repeating lines and arches and domes whereas Gaudi has created a masterwork of modern art and design that is both organic and audacious. In both photos I was standing in the middle of the cathedral looking straight up. I since wondered what would happen if the two were merged, and this is one possible result. A clash of ideas, a combination of opposing forces. To me this might highlight the idea of the duality and its fusion back into singularity. Simply put, duality is two halves of a whole. We see it in every aspect of life around us. But what happens if we merge back to a singular state rather than opposing perspectives. This quickly gets metaphysical and takes me into uncharted waters, but you get my drift. Its just an idea, but one I've had from time to time. In effect, this image is a representation of an abstract thought exercise that imagines the re-combining of ideas into one. Or, if you prefer, this is how I doodle and daydream.